One makes ink by rubbing a ink stick on the surface. This flat surface where the ink is ground slopes into the reservoir for the ground ink. One can also pour liquid ink. There is various sizes and forms. For SHODO practice, the size of 12-15cm x 5-7cm would be a good size. One should always wash with running water and dry with paper or cloth after the practice. I sometimes use a soft tooth brush to get rid of dried piece. The SUZURI is sculpted from the slate / shale of ancient quarries or riverbeds. and a smooth, hard impermeable surface. A fine quality SUZURI can be inherited over 100, 1000 years. 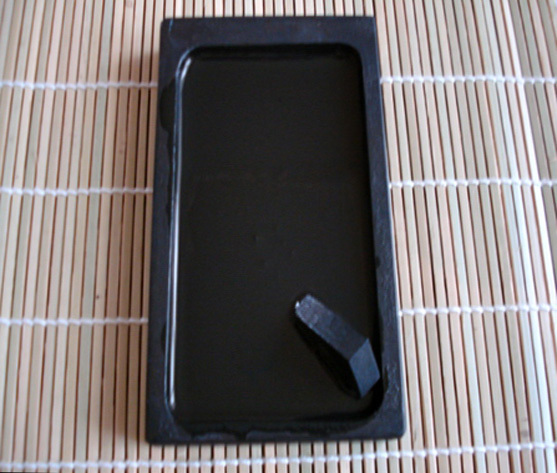 with the natural shape of the ink stone. Famous Suzuri artisans in Japan are based in Yamaguchi, Yamanashi, Mie and Miyagi prefectures. In addition, there are Suzuris made out of ceramic, laques, and soft stones. They are not commonly used for practising Shodo but more for our eyes.